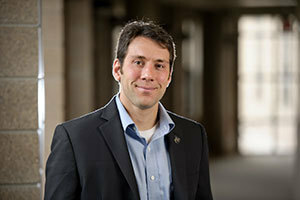 Justin Crepp, an astrophysicist and the Frank M. Freimann Assistant Professor of Physics at the University of Notre Dame, will participate in a Congressional briefing on Wednesday (June 24) about the potential of science to change world in the not-too-distant future. The briefing was organized by the Science Coalition, a nonprofit, nonpartisan organization of more than 60 of the nation’s leading public and private research universities that is dedicated to sustaining the federal government’s investment in basic scientific research and protecting America’s preeminence in research innovation. At the congressional briefing, Crepp will discuss his predictions for what space discovery will be like in 2034, focusing on one major piece of equipment that will provide a leap forward in galactic understanding and discovery — an eight-meter telescope equipped with an advanced starlight suppression system called the Terrestrial Planet Finder (TPF). Crepp, co-discoverer of more than 80 extrasolar planets, is currently building a precision spectrometer that will detect Earth-like planets orbiting in the habitable zone of the closest and lowest-mass stars in the galaxy: the M-dwarfs. Crepp’s work has been supported by NASA and the National Science Foundation, and he is a recipient of a 2013 NASA Early Career Award. As a member of the Science Coalition, the University of Notre Dame joins the nation’s top research universities in a common objective to educate policymakers on the important role the federal government plays in furthering each university’s research mission of developing innovative, cutting-edge solutions to some of the world’s most complex challenges. To listen to a podcast of the briefing, please visit: http://www.science2034.org/science-2034-live/podcast-science-2034-live/. Originally published by Mandy Kinnucan at news.nd.edu on June 23, 2015.